I thought that you might be interested in our latest acquisition. 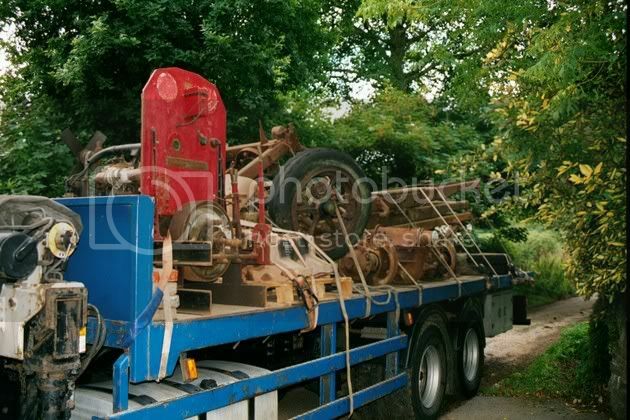 It is a WW1 Dennis truck chassis. 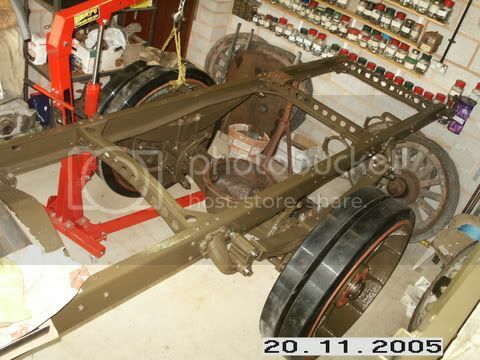 Ok. Not a lot to see there i agree, but it is to be used as parts for another WW1 Dennis that we are currently restoring. Luckily, it has the complete differential and cover still in place. 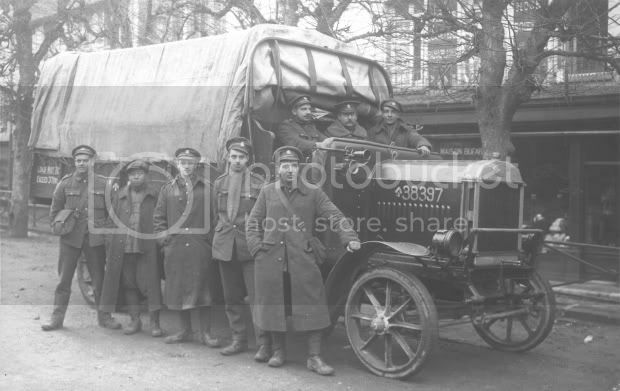 It is very rare to find any WW1 truck and one with any element of the drive train doubly so. This one only survived because it was used as foundations for a seaside bungalow in Cornwall. 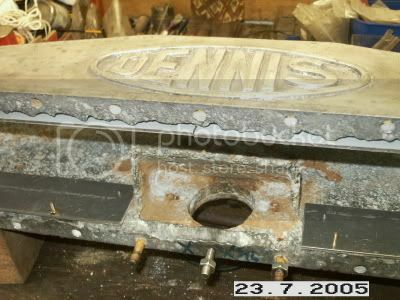 When the bungalow was demolished the chassis was found and then rescued by a chap who thought it too good to scrap. He effectively gave it to us so we just had to pay for the transportation. The scrapmen obviously found the diff too hard to get out and we have since extracted it. It is in very good condition and will soon be ready to drop in to our other Dennis. Getting a new diff made would have cost us at least Â£5,000 so we were very lucky indeed. Great find Tim!! at least the guy who found it realised it was too good to scrap and passed it on to you. 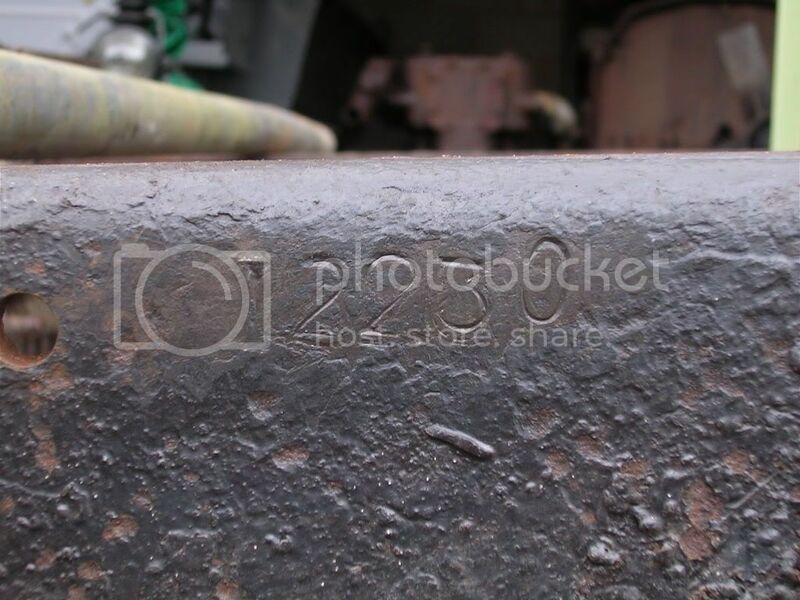 I will check out a trailer that used to be on a local farm,the rear end of a WW1 era truck with a hitch welded to the front. congratulation on your find, i dont suppose theres any form of I.D. on the chassis to describe it in it`s former glory. That is very good of you to look out at the other chassis for us. The chassis is always the bit that survives. 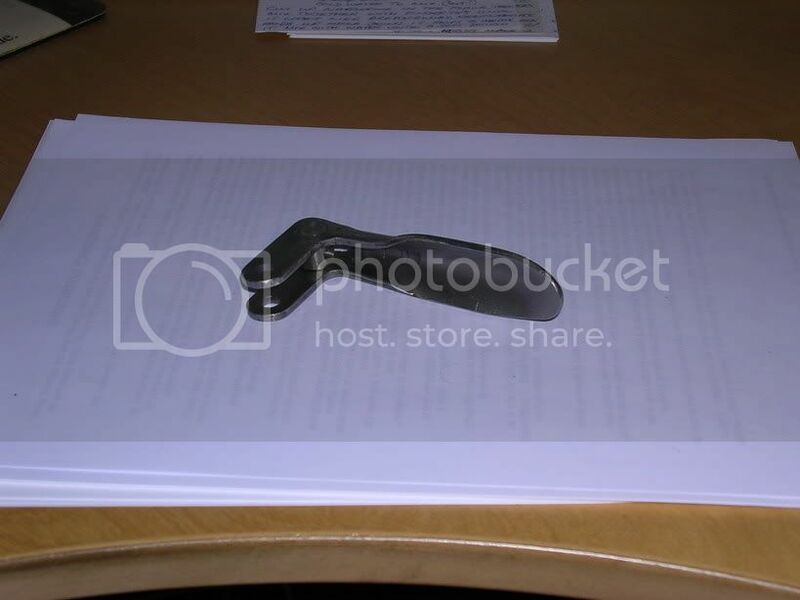 It is finding something that is attached to it which is the rarity. Most of them were turned into farm trailers or house foundations at the end of their life. If it is indeed just a bare chassis then i am sorry to say that it wont be of any interest to us. If there is any of the drive train remaining then you would have to hold me back. If you would like me to identify it, do please put up a photo, i am always interested. We initially purchased 5 Dennis chassis and a pile of parts. Since then we have found two more. The one that we are restoring was used in a garage to hold up a first floor. 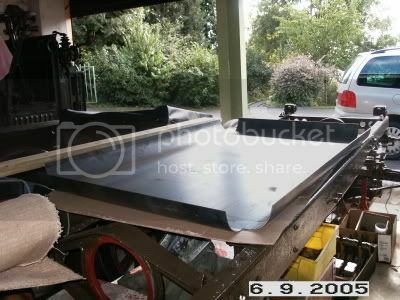 As a result it was in very good condition although had been entirely stripped. The other chassis have all provided useful parts. The engine we have was made at the end of the war but not put into a lorry, but to operate an auxilary fire pump. We therefore believe it to be in very good condition, although we have not really touched it yet. 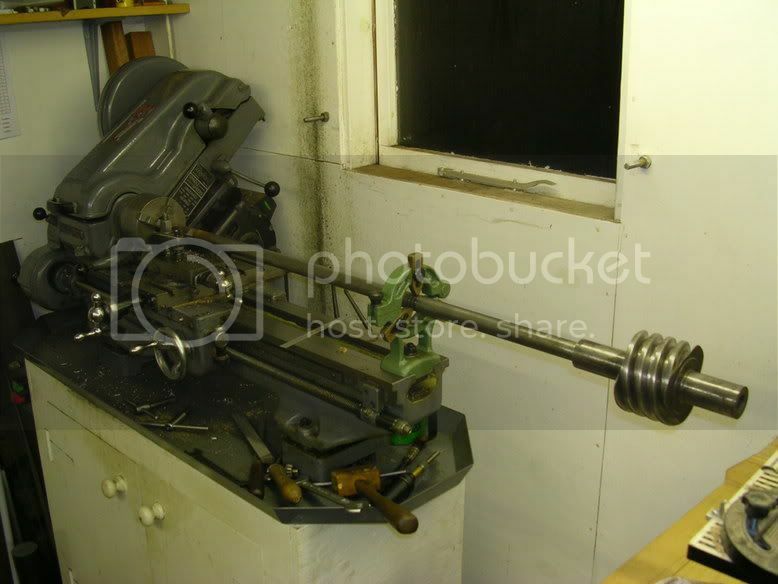 We have three gearboxes which are all very poor. But we hope to be able to make one good one. In response to the identity of this one we have the chassis number of 12230, which is just 225 above the chassis that we are restoring. This dates it middle to late 1918.
although it has taken us great deal of time for us to get this far. I use the word "us" to describe my Brother Steve and my Father Tony. it really is a group effort. Although we do not have a member of the Chinese Labour Corps to stand in to recreate the photo. You guys do very nice work indeed! I will check out the trailer,I know the rear axle and twin rear cast wheels were still on it.give me a few days. Superb work,the difficulties you must have to overcome really put our efforts with WW2 vehicles in the shade. Thanks for your very kind words. 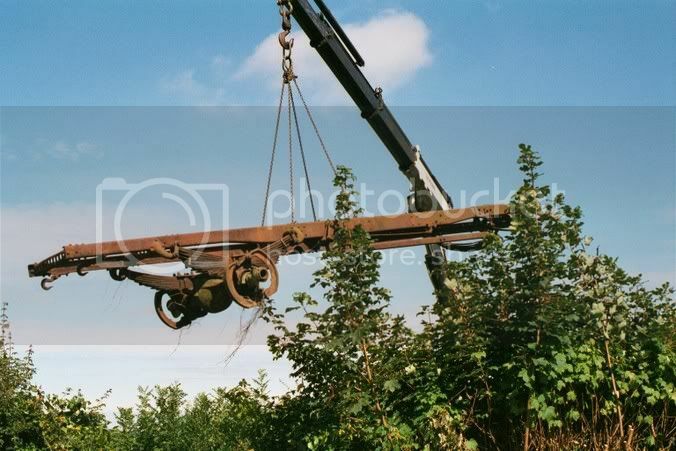 We certainly try and do the best job that we can and restore them to a running but "used and well cared for condition". We have been accused on occasion of a kind of "cultural vandalism" in acquiring all these old chassis to source parts for our restorations as the feeling was that these other chassis should be saved for posterity and future restorers. However, just about in every case these chassis were due to be cut up and we have saved them from that, if only to loot them for spares. The honest truth is that very few people are interested in restoring WW1 trucks and there are probably around only 20 survivors in the UK (although probably a similar number of ex military but restored as civilian). But saying that i can think of at least five more currently under restoration as military. There are however a great number more resting in barns or sheds awaiting rediscovery or an enthusiastic new owner to take them on. There are two just down the road from me here in Oxfordshire, who's future is uncertain. But both in very good condition, although at great risk from vandals and thieves. Hopefully they will find new homes shortly. 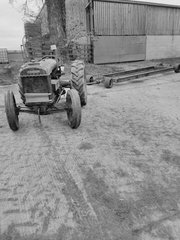 As in the 1950`s when the british army were selling off thier jeeps they were called in to a depot all the live, dead and dying vehicles, stripped down and re-built to put up for sale using spares from damaged or wrecked vehicles. Thanks for your kind comments. I will be happy to keep the forum updated with our progress, but it is a slow old job, so do expect it go on for a bit. 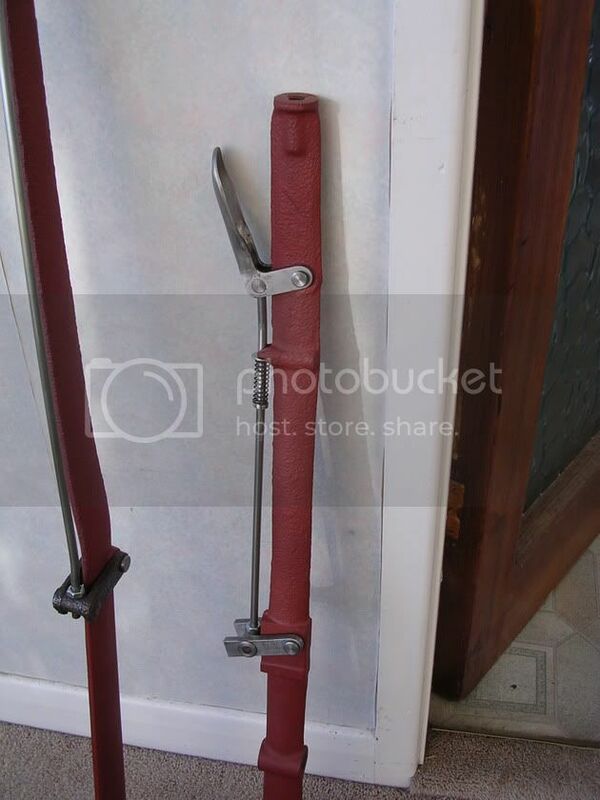 Here is a photo of the new scuttle. It has been rolled out for us, but we need to still put the curve in the corners. 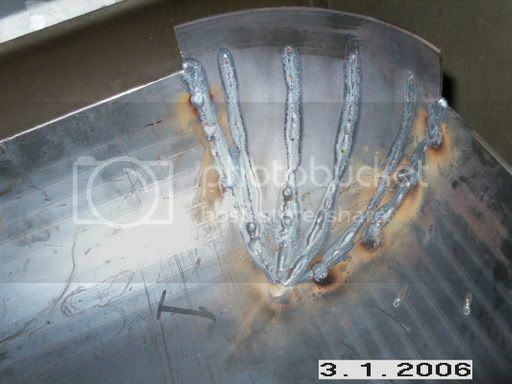 Steve has worked out how to make the corners by cutting other pieces of steel into "fingers" and then bending those up and welding them together he can get the fine curve. 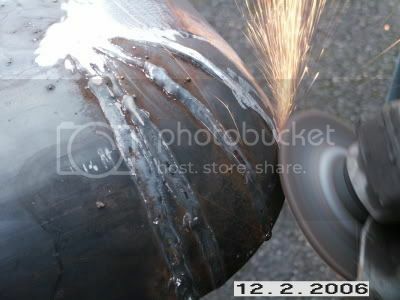 These will then be welded into place. Not an easy job and it will have to be done four times, so we will let you know how we get on. 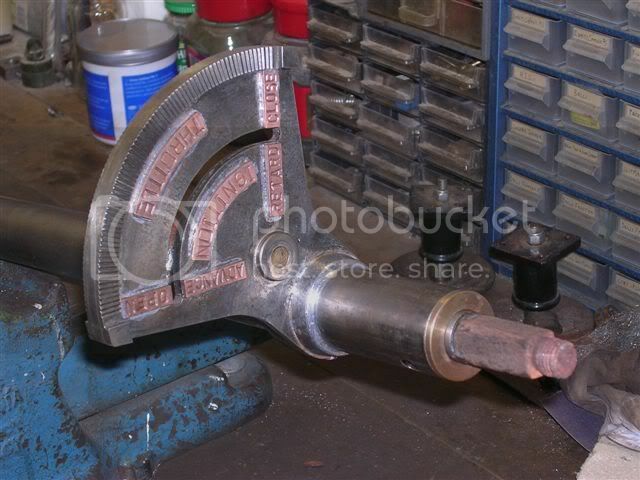 Of course we also will have to cut holes for steering column etc as well. This will be a bit further down the line. Our next job is to get the rear wheels back on. 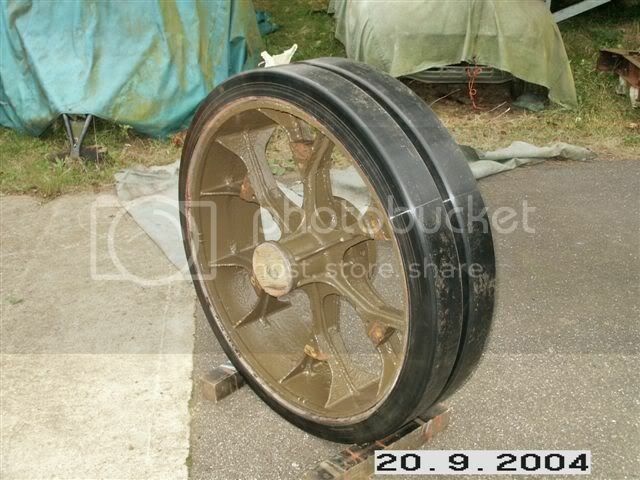 The back wheels have new tyres on them (which we had to get made) and look something like this. Since that photo was taken we have selected the best brake bands from our spare chassis and have mounted them to the wheels. 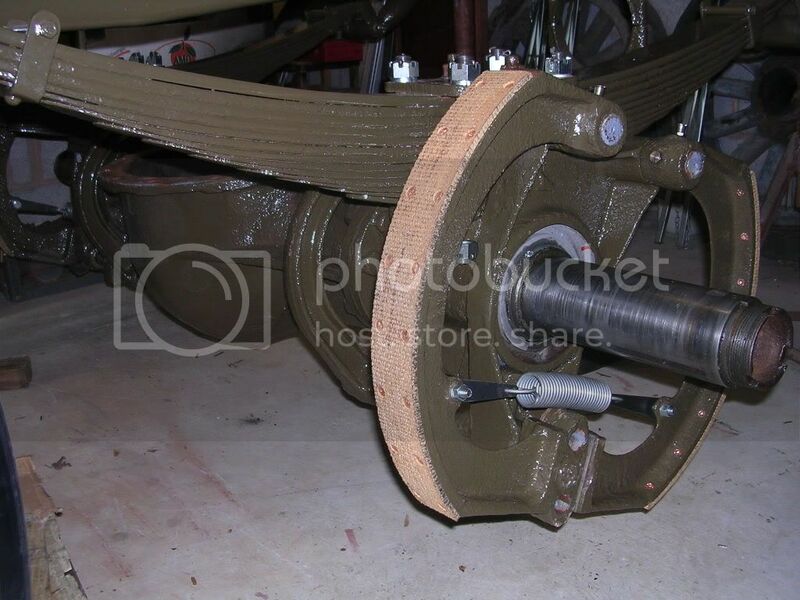 When we next all get together we will put the wheels on to our newly mounted back axle. They are very heavy and it will require a group effort to get them on. We do have many many hundreds of photos of the work so far, but will post up photos of what we have been doing most recently. It is an incredibly slow job as you can tell. 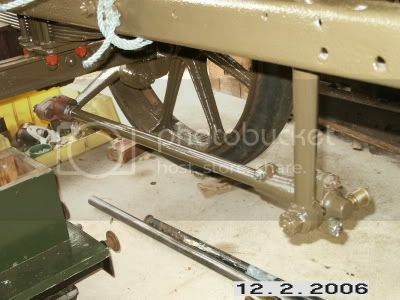 The final photo here is of the freshly mounted back axle, just about ready to take the wheels back on. Great work there, you should be very proud of what you lot have achived. It has been a while since my last update, but i thought i would keep you up todate with what we have been doing. I contemplated starting a blog to do this, but we seem to be so far along now it is not worth the bother. Anyway, the restoration has come along in leaps and bounds since my last posting. This is mostly due to Steve's remarkable work. Unfortunately, now that there is a weight upon the wheels, one of the tires has seperated from the top of the wheels. This is very bad news as with a short period of use the whole tire will fall of. We have not yet decided how to remedy this but it will mean taking the wheel of again. A friend has just welded them in for us. They will require a great deal of time and effort but should look the part once given a trim and clean up. It looks a bit odd at the moment, but trust me, it will be right. Steve, in his spare time has made up the correct gear change and hand break release, using the rotten remains of an original as a pattern. He then reassembled the gear change and hand break with some original and some new linkage. GWT that is one impressive restoration, how long have you been working on it, and how long do you expect to be working on it. 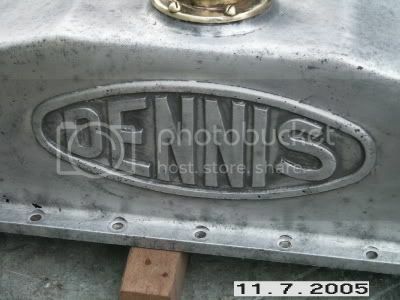 Sorry to take so long to respond but i was trying to find the early photos of the Dennis. You have made me realise that we have been at this for about 4 years now. Steve and i have realised that we both have less hair in the more recent photos than we did when we started off. As for finish time, well 2 years maybe, or until we run out of hair if that comes first. Three and a half chassis, one engine, 3 tired gearboxes, a pile of wheels and axles, 1 radiator and some other bits and pieces. The White and Poppe engine was a great acquisition. 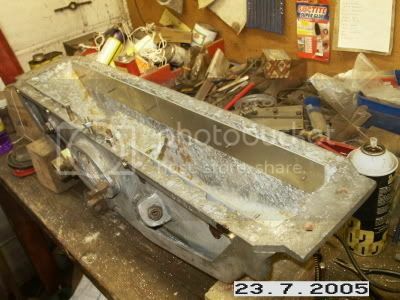 It had been used as a water pump and was just about complete (missing its own water pump). It looked as if it could be started without too much work at all. Unloading the chassis was entertaining. 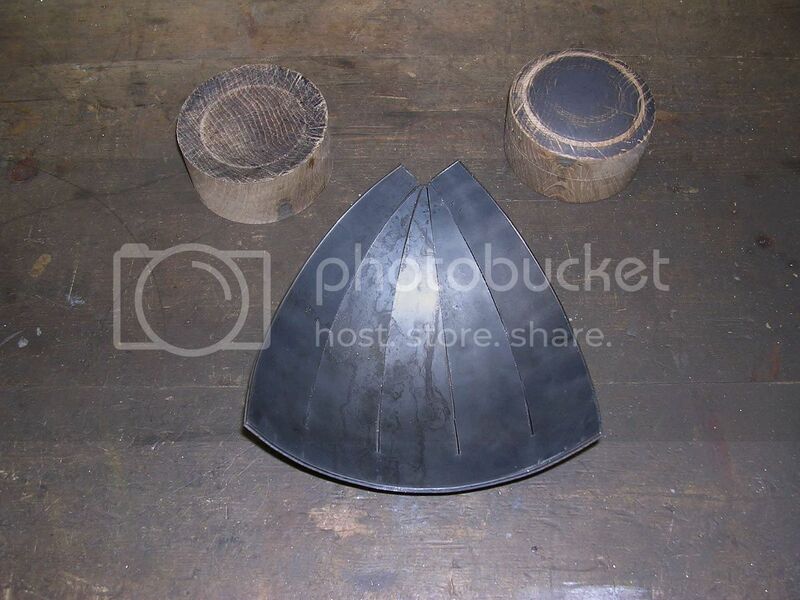 Of the 5 that we purchased, the back half of one had rotted away entirely, another one was perfect except that a big chunk had been cut out of the front. Another was complete but had been broken and fixed. The two remaining ones had been stripped of everything and had been used in a garage as roof supports. One was perfect, the other was cracked and plated. We used the best one and kept a second spare. We hardly ever thought that we would in time acquire two more. Here are the best two being unloaded. You can see where the top chassis has been plated. including the rotten sub frame. This was the only one of these that we had. 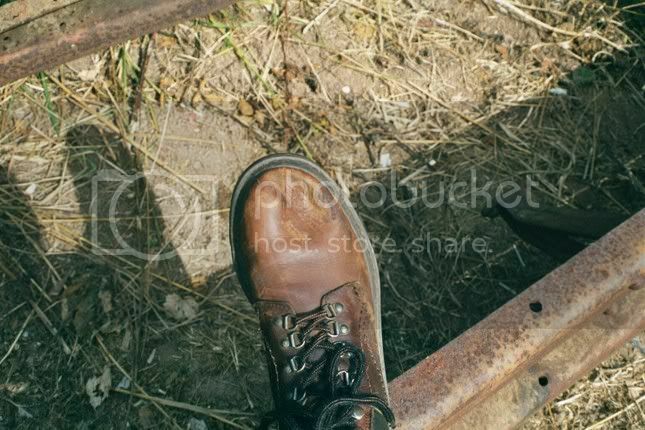 This is what happens to a steel toe capped boot when you drop a WW1 truck on it. Everyone was slightly concerned to see this happen especially when i did the 50 yard hop, while shouting "Aaargghhhh". Luckily the boot survived. Then over Christmas we fixed the column into the chassis. The steering column mounting bracket was out of a different chassis and was a real s*d to get into place. 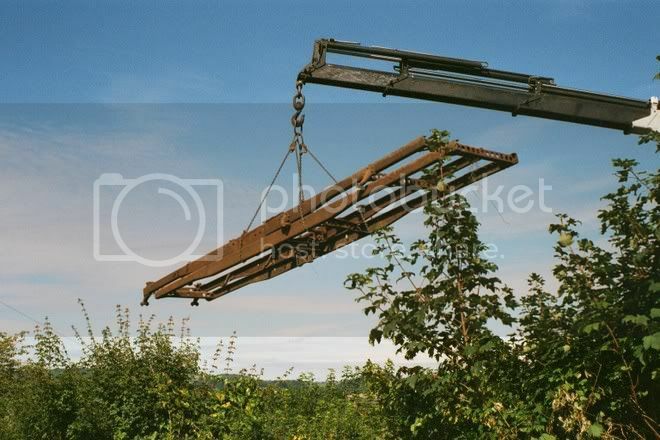 But with lots of belting it was coaxed into position. The freshly mounted gear change and handbrake control can be seen behind the column. Wow great restoration, wasn't aware of any privately owned WWI trucks in the UK apart from the Thorneycroft owned by a re-enactment group. Do you have any other trucks or vehicles? Yes, you are quite right there are not a great many of WW1 trucks around. However, i would think that in the UK there are in the region of 30 in all, although a number of these are not running. The Thornycroft i think you are referring to is probably the one owned by the Hampshire County Council who let the Great War Society use it. Our own collection consists of 6 WW1 trucks, these being the Dennis, an Autocar, a Thornycroft, an FWD, two Peerless TC4's, a civilian Autocar truck of the same period and something rather modern - a 1944 Jeep. The Peerless trucks is actually the remains of about 9 (i think), but with enough bits to restore two of them. 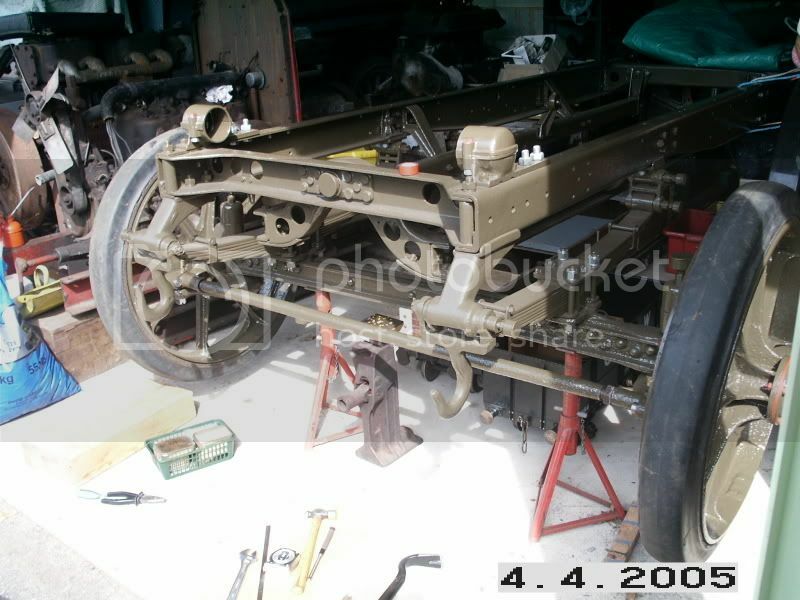 The Thornycroft is also unrestored but we have almost all of it except the diff (the commonly missing bit). We recently recovered an original engine for this in New Zealand of all places. Bear with me for a little bit and i will get photos of them all up on the forum. I will have to do some scanning first of all. These are the others in our collection. This is an Autocar. As far as we know the only survivor of 265 used by the WD in France. Purchased as a wreck and rebuilt by us. This next one is an ex US Army 1918 FWD Model b truck. Cosmetically restored and returned to running condition by someone else, then completely dismantled and rebuilt by us with the correct body. Nest, something non military. another Autocar. Also from 1918, this one spent most of its life in the basement of the Lazy Susan Saloon in Woodbridge West Virginia USA. Exported to UK as part of a job lot. It changed hands several times before being acquired and restored by us. 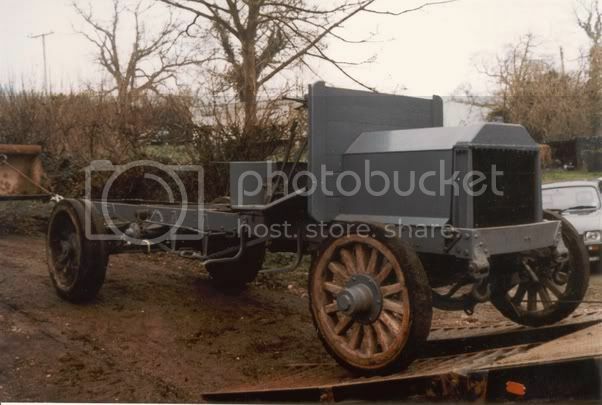 The next one is the Thornycroft J Type. The one we have had the longest and have been collecting parts for all this time, but have not really started. It is the next one in line after the Dennis is finished. Balanced on top of it is a spare Peerless chassis. My favourite though are the Peerless trucks. These have a very sturdy appearance and i am led to believe were a favourite amongst their drivers. Of 15,000 acquired by the British in WW1, there are 6 survivors. We have two of them, both very restorable. We just need the time to do it. This one is how the most complete one was when it arrived. it had been cosmetically restored and needs a complete rebuild. 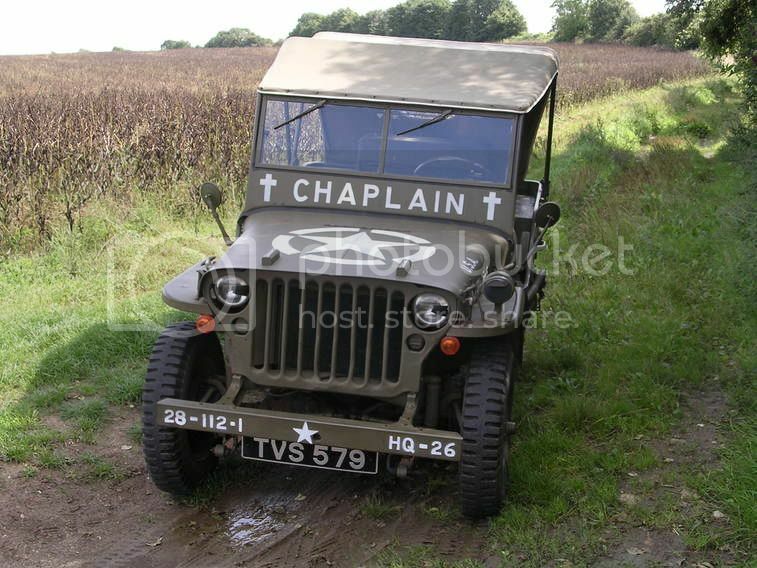 The word Chaplain is there for a bit of a laugh, but is of course quite correct. Gets me lots of ribbing at the showground and on occasion unpleasant comments - well we can't all be 82nd Airborne now can we? 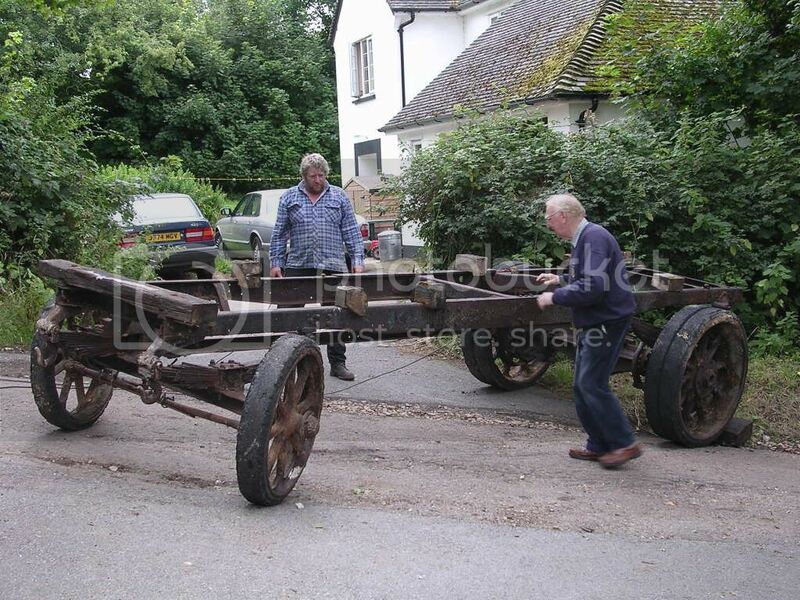 Wow nice - are the Autocar and the FWD the same ones used by the US Doughboys re-enactors? Yes, you are right. 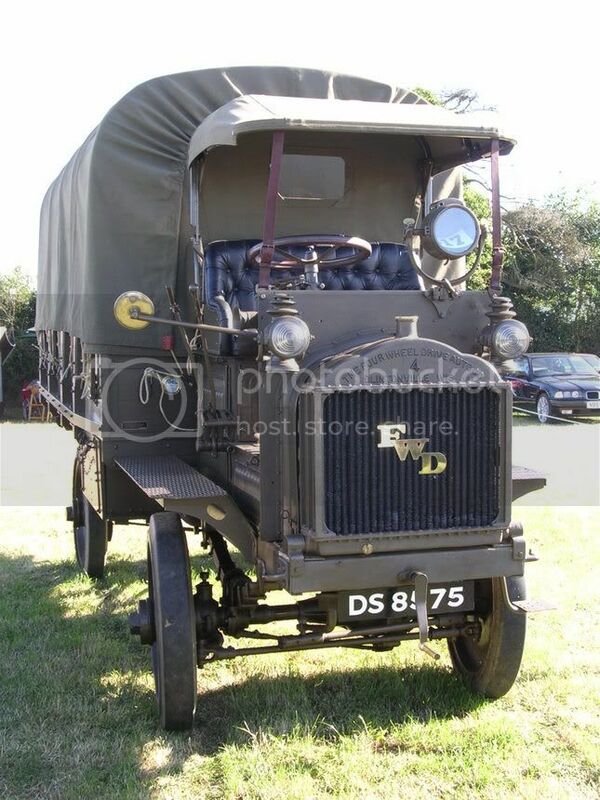 Both trucks went to the WW1 truck do at Basingstoke and the FWD went to Detling. Pershings Doughboys then came down to Devon for an event there too. It would be nice to do more shows with them but the cost of moving them is as you can imagine exhorbitant and they are a bit too slow to drive far on the road. Both Autocars have done the Bournemouth to Bath road run which is about 90 miles. Dont think the FWD would be very happy about that journey though as it is a slow old beast. Those vehicles make a very intresting collection, its just a shame that there arnt more about, Ive seen Duxfords FWD "its very dusty", and your Jeep I like very much as its a change from the majority of those out there. Yes i have seen the Duxford FWD and dusty about sums it up. It is a pity that although a runner (like their WW1 Thornycroft and Fiat) they just never go out and get used. They also have a WW1 Leyland although that is entirely in bits as they have got no one to restore it for them. 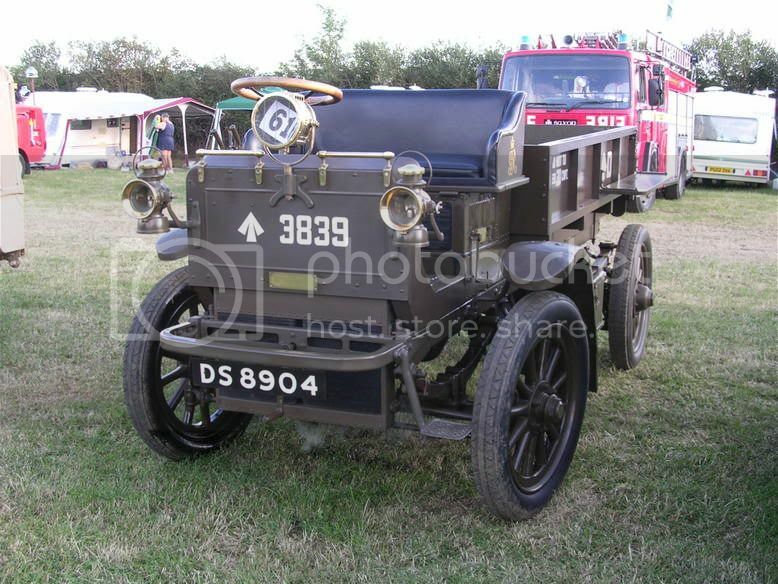 There are quite a few WW1 vehicles about but they are so slow and difficult to move around that they generally dont go out to shows very often. There is another FWD in a shed about 10 miles away. The last time that one went out in the open air was in 1965. A pity that these dont get used as it would be great to see them all out together. 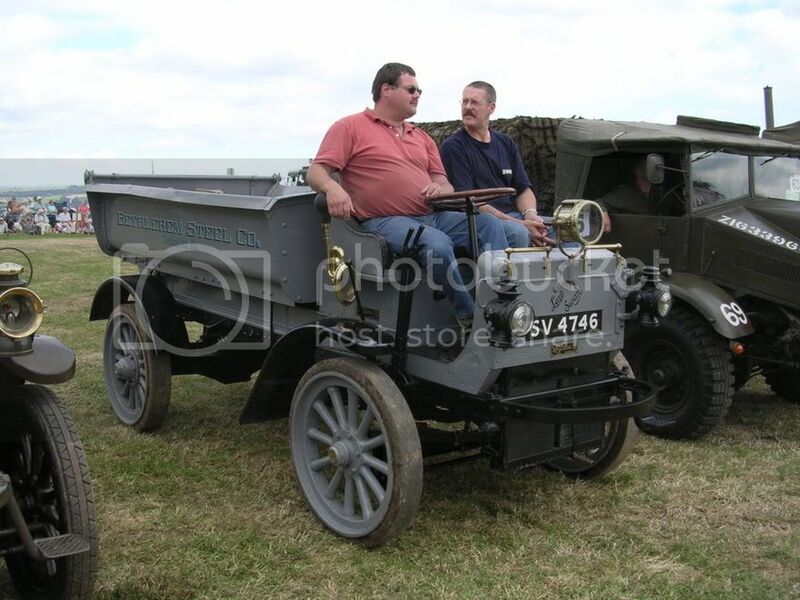 We were involved in a WW1 vehicle show a few years ago. There was 5 trucks, a motorcycle and 2 field kitchens. With more warning and better advertizing i am sure that we could have had in the region of 15 trucks there. Oh well. Maybe next time. Have just gone through this thread outstanding and words like that don't really do justice to the hours of dedication and the quality of the work just shines through. Well thanks for your kind comments. It is really greatly appreciated when people notice the effort that we put into these trucks. I think that the general public would not even notice or understand what work, effort, time and money goes in to them. A good job that we do it for fun really. I have lots more interesting photos to add and some exciting news, which I hope to post in a few weeks time once we get it home. More later on this. 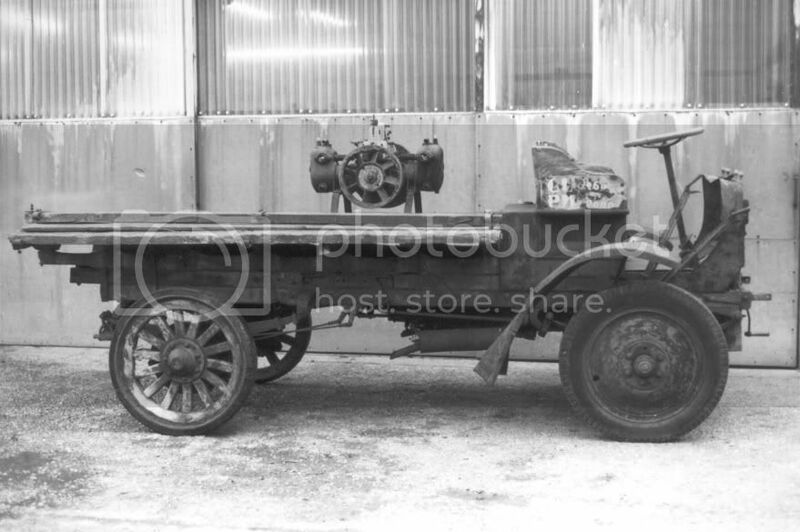 I have scanned a picture in of the British WW1 Autocar as we acquired it. It was still in regular use as a coal lorry up until 1956. 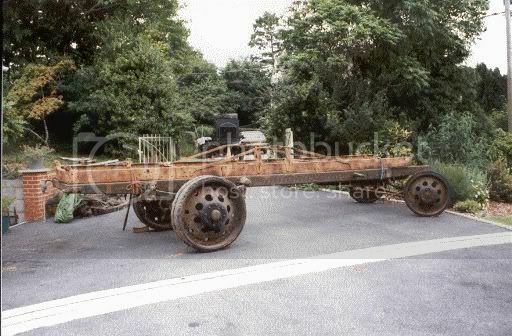 It must have had a hard life as the chassis and a second chassis that was bolted on top had been broken - probably due to over loading. It was totally worn out with just about every moving part needing attention. It did come with a spare engine bolted to the chassis which was nice. Anyway, back to the Dennis. 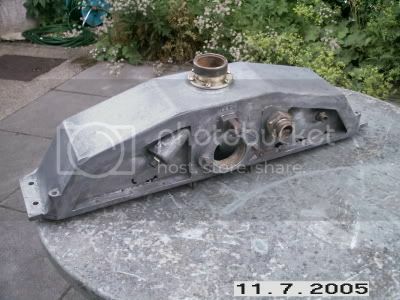 We have made a new drag link using the original castings and a new steel bar and have fitted that. 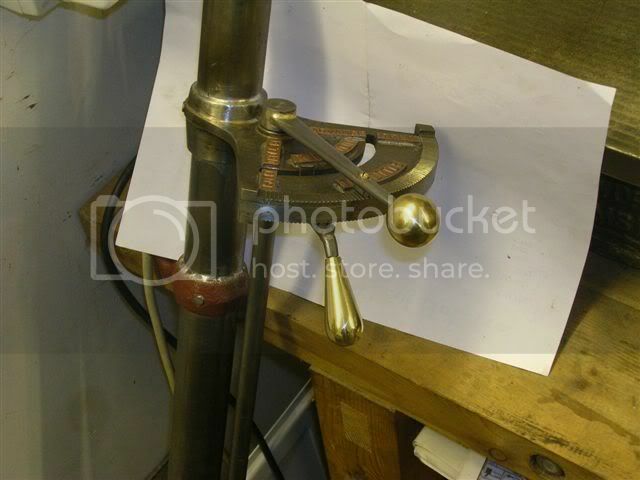 So the steering is nearly completed. Just the correct pattern steering wheel to find or make next. The end result is really quite satisfying. The scuttle does need a great deal more work doing to it though. 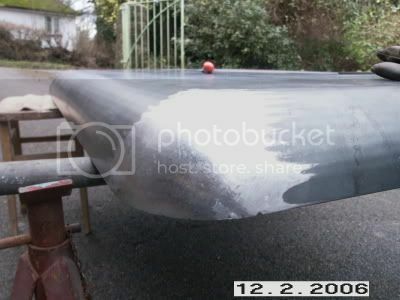 But once it, the radiator and the bonnet is on it will look like we are really getting there. I will tell you about the bonnet and radiator next, but will wait a bit until they are more photogenic. 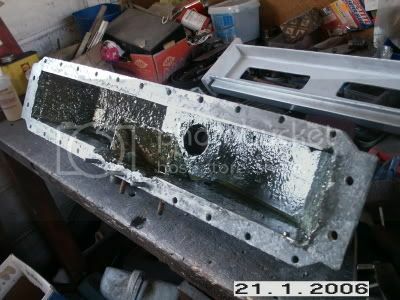 As i have not posted anything for a while, i thought that i should add some photos of the restoration of the radiator. As you can probably tell from the dates on some of the photos this has been going on quite a while and i think that Tony is sick to death of it. 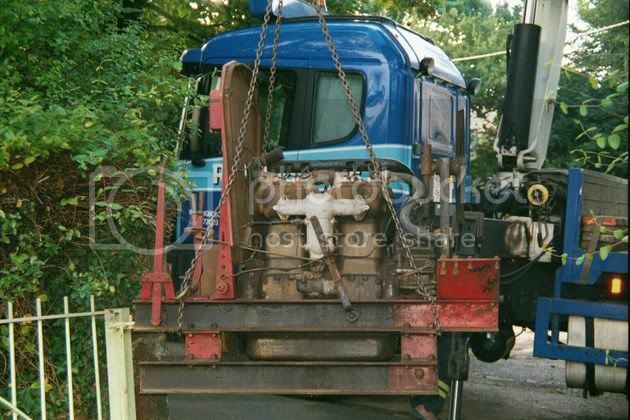 As you know, by now we have acquired the remains of 7 Dennis lorrys now, but we acquired an engine and radiator off of a water pump. 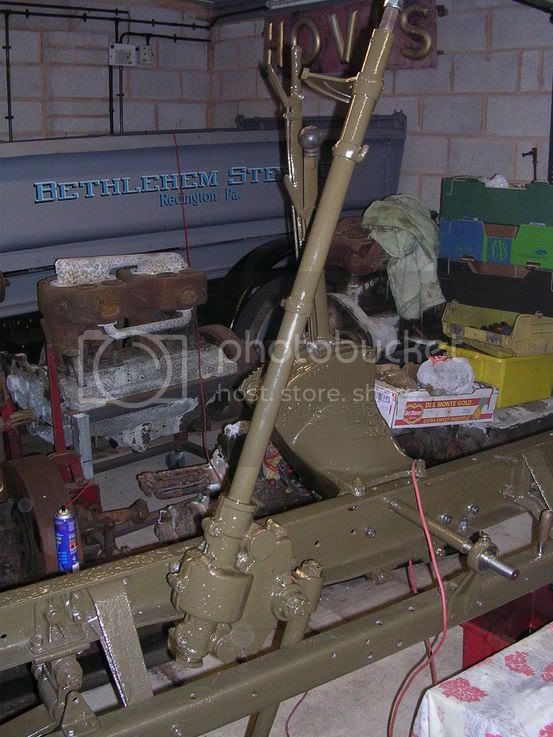 These are the correct ones for our restoration and we think that the pump was assembled from bits left over at the factory not long after the end of the war. However our thrill of having an original radiator lasted up until the moment that we took it apart. It had obviously been sitting full of water for a large part of its life and was terribly corroded. There are lots of interesting photos of this, but i will start off with just the top tank. This is what the inisdes looked like after we took it apart. 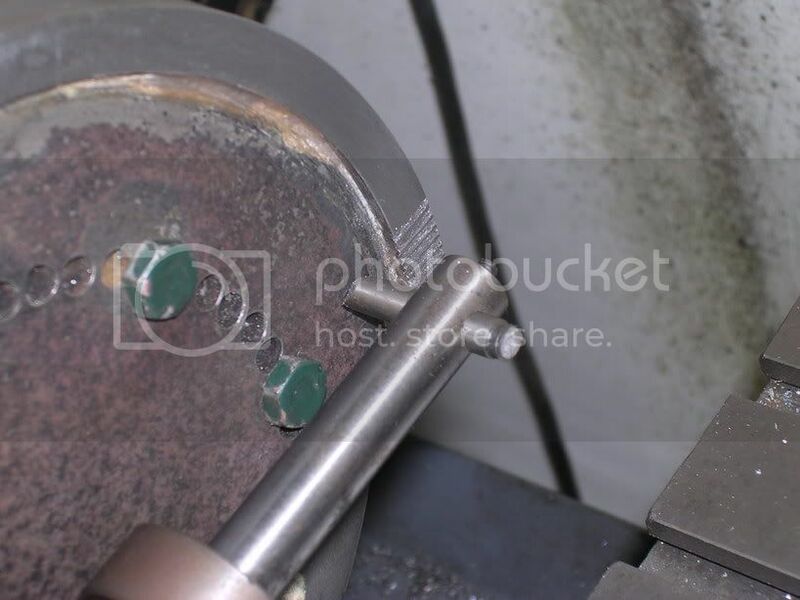 The aliminium is rotted away almost the entire lenght of the flange. One option is to make a pattern and get a new radiator cast. However, Tony thinks that he could fix it, so he drilled holes in the casting to which he bolted aluminium plate reinforcement. Then packed the gap full of Devcon which bonds to aluminium. Then painted over the whole lot with an epoxy resin.